How To Hire Software Projects Outsourcing Agents? Globalization and innovative technologies allow companies to save their resources, money, and efforts as well as optimize their business processes. Outsourcing is the most popular way to do that. On the one hand, delegating some piece of tasks to other companies helps to reduce expenses, and on the other hand, - to focus on developing main activities. Besides, this is a good way to attract external resources which may include knowledge, experience, etc. If you want to effectively employ new capacities, you should know how to hire software projects outsourcing agents. Let’s figure out what the reasons for outsourcing are, what things to consider when outsourcing, and finally, what steps of hiring IT experts to follow. 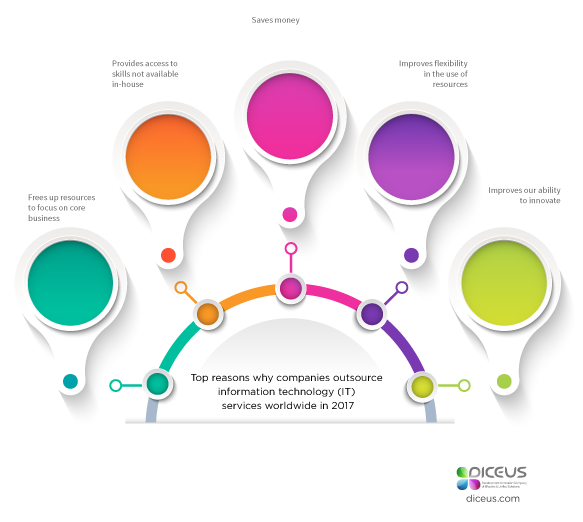 According to Statista, in 2017 among the top reasons why companies outsource IT services worldwide, there were such as cost-effectiveness, flexibility enhancement, innovation, focus on major business activities. Those will hardly change this year. Reason 1 - You save your money. Delegating some functionalities like IT, accounting, or marketing can significantly reduce your operating expenses and increase profit. Thus, you turn your standing costs into variable expenses. Your company becomes more flexible and competitive. Reason 2 - You save your time and get an opportunity to grow. In the context of small and mid-size business, outsourcing helps to focus on the main activities and use financial and human resources more effectively to execute operational and administrative matters. Reason 3 - You get access to a great talent pool. You hire professionals with a strong background in a particular field of knowledge. When it comes to outsourcing, you may be sure you will get the required services at a reasonable price. Reason 4 - You get access to external resources on markets different from yours. When working with software projects outsourcing agents, you can establish new links, employ new capacities, and find true professionals. Reason 5 - You can lessen your dependence on certain employees. Outsourcing companies regard their activities as a business, not as a profession. To stay competitive, they take care to ensure that the services they provide are of high quality. It is sometimes tricky to draw such an approach to work from in-house employees. Reason 6 - You can decrease the burden on management. The fewer tasks are completed inside the company, the less management has to control people. Instead, they can focus on the major activities. In such a way, you can decrease the expenses for managers (time of managers, forgone earnings, etc.). Reason 7 - You can reduce your operational risks as well. Delegating a piece of functionalities to software projects outsourcing agents, the only thing you have to do is to control your vendor of how he makes good on the contract. Reason 8 - You can keep your company compact. Outsourcing is good when you don’t want to increase the number of your employees. It will help you also if you want to reorganize your business or optimize your operating processes. Reason 9 - You can reach out foreign markets. Some companies use outsourcing to reach out new foreign partners. With the help of offshoring, they can broaden their sales areas. Companies choose a certain type of outsourcing depending on their needs and opportunities. Some delegate two or three functions to an external vendor, the others find keeping a staff of 10 people comfortable whereas delegating the majority of tasks to outsourcing agents. However, all these people have the same goal which is to increase the flexibility of a company’s business model and reduce the costs. Whatever your reason to outsource is, you should learn what factors to consider if you want to find reliable software projects outsourcing agents. What The Most Critical Things Should You Consider When Outsourcing? Below are the most important things you should pay great attention to when hiring external resources. According to the information provided above, saving money is the third main reason why companies search for outsourcing agents. However, you should consider the costs and the metrics to measure the cost efficiency of outsourcing. When you decided to use outsourcing, you are more than likely expect that it will help reduce costs in comparison to the costs incurred when you use the internal capacities of your company. 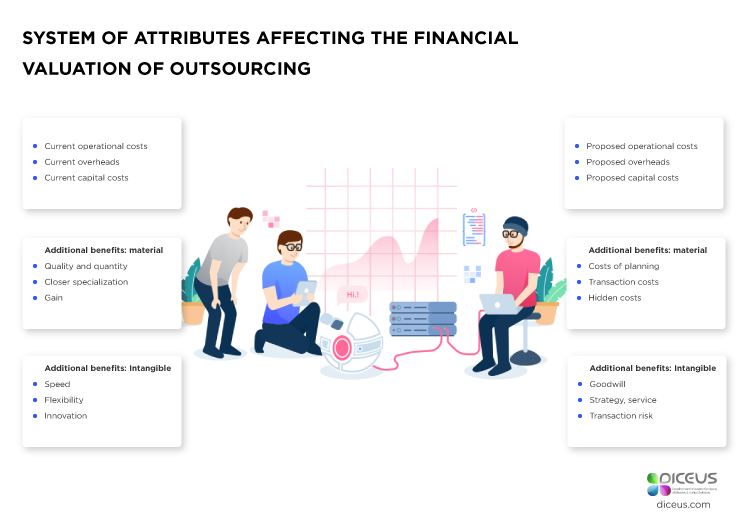 If you want to measure the cost-effectiveness of outsourcing you should compare it with your own processes, and calculate all the costs related to both. Production costs or simply put, the costs invoiced by the vendors for delivery services. Transaction costs - expenses for creating a contract, communication and coordination costs, consulting services costs, costs of the services provided by external experts if any. Hidden costs which may include travel costs, transfer of activities, change of business processes, cultural diversity, etc. The evaluation of outsourcing cost-effectiveness is often compared with the evaluation of return on investment (ROI). Here are top attributes affecting the financial valuation of outsourcing. The valuation of cost-effectiveness is one of the most important factors affecting your decision-making process concerning the use of external resources. To become an industry leader today, most companies look for disruptive innovation. Disruptive innovation is not just a buzzword. It is a powerful tool for changing the correlation of values on the market. To stay competitive businesses have to transform their products and services to make those stand out from the crowd. Outsourcing IT services which assume the use of innovative technologies can lead to the best outcomes as in-house employees are very often too close to the existing business processes to think out of the box. Before outsourcing, conduct research on the IT companies which have a strong background in disruptive innovation and get to know what revolutionary approach they use in their work. Selecting a wrong technology partner may put the clock back. Be accurate when choosing outsourcing software projects developers. Use standardized formats of communication to avoid confusion and misunderstanding, facilitate effective workflow, and reduce the time needed to complete the tasks. Agree on the main channels of communication (instant messengers, emails, etc.). The same goes for the time-tracking and dashboard tools to manage effectively the workflow and monitor the work progress. Make sure you know about all communication barriers. If your technology partner is based offshore, make clear that language, culture, and time differences won’t rock the boat. Now that you know the main reasons why companies may look for outsourcing providers and the things affecting the success of this business model, we can proceed to a step-by-step guide on hiring outsourcing agents. Step 1 - Research on countries. First off, conduct research on the best software outsourcing countries. Factors to take into account when selecting a country may include distance from your region (offshoring/onshoring), culture, language, and time differences, developers rates, etc. Step 2 - Research on companies. When you found the region/country which meets your requirements, search for the best outsourcing companies within this region or country. For example, check out our list of 10 Software Development Outsourcing Countries in Europe Which Can Draw Your Attention. Step 3 - Choose several companies. Select a certain number of companies which you consider to be the best fit for you. Send them your IT product requirements and specifications. Ask them about estimations on how it will cost you to get outsourced services. Step 4 - Communicate with software projects outsourcing agents. During your communication with companies, you should learn if they have enough management, technical, and industry experience to deliver high-quality IT solutions. You may ask teams to show their portfolio and tell you what technology stack they used to develop projects. You should make sure that developers are able to deal with your project. Step 5 - Make your choice. Service Level Agreement (SLA) is a document containing your requirements, reports, time of meetings, and Scrum sprints. Key Performance Indicators (KPI) is a set of indicators used to evaluate the stages of the project realization. Non-disclosure Agreement (NDA) - a document which can protect your data and information about your project. Step 6 - Ask specific questions. Do your developers correctly handle your objectives? Is your team familiar with innovative technologies? Does it apply those? Are you completely satisfied with the skills and experience of your developers? Do you trust your developers? Does your team have support from senior specialists? Read how the answers to these questions can help you in the guide (link above). Hiring the right software projects outsourcing agents in the USA and other countries of the world takes time and efforts. If you are planning a long-term business relationship, think of finding a technology partner. It’s probably the best way to faster get the benefits of your mutual work. In our company, we believe that only technology partners can delve deeply into your activity and industry sector, and thus, bring you the most of the results. If you have any software development projects available for outsourcing, contact us to get recommendations on projects successful realization.